At around 6:30 pm on May 2, the sky suddenly turned a dull yellow in Agra city, Uttar Pradesh. After a few minutes, it was completely dark and a fierce wind began blowing, bringing along with it loads of dust. The speed of the winds increased and the trees started shaking violently. Tin roofs of many shops and houses were blown away. “The hoarding near our tent broke and fell down. We got scared and rushed inside,” says Rahat Ali, who runs a nursery. A few minutes later, hail and rain started pounding the region. 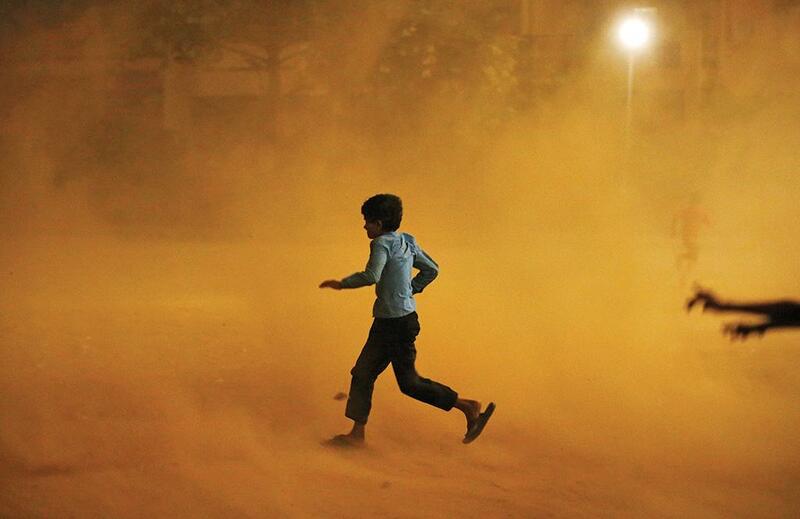 A pall of gloom enveloped Agra district, the epicentre of the massive dust storm that ravaged large parts of India. There were 14 members of Ali’s family inside the tent, including kids. “The winds continued to howl and suddenly we heard two loud, cracking sounds. Two trees had fallen on either side of our tent,” says Ali. The family members started praying, afraid that one more tree falling would end their lives. The fallen trees had blocked their tent and it was only at 11 am the next day that the family managed to come out of their tent, after neighbours cut down large parts of the broken trees. Since February this year, India has witnessed more than 44 storms in 16 states. About 423 people have been killed and over 785 people have been injured. The storms also caused massive damage to property—almost 5,000 houses collapsed. In some places, wind speeds exceeded 130 km per hour—when the threshold speed for storms is about 90-100 km per hour. The storms also affected people’s livelihoods. Apart from killing live-stock, standing crops in nearly 0.7 million hectares in Uttar Pradesh, Madhya Pradesh, Maharashtra, Bihar, Telangana, Chhattisgarh and Jammu and Kashmir were destroyed. In Punjab, 0.9 million quintals of harvested wheat were ruined. Uttar Pradesh and Rajasthan suffered the maximum damage. State governments are conducting an assessment of the damage, but in Bharatpur district alone, locals say the infrastructure loss could be more than a hundred crores. 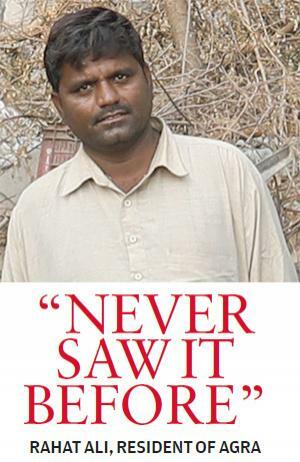 “One can earn back the money, but what about the lives lost,” asks 60-year-old Churamal Singh. Singh is a teacher in Junethar village of Deeg tehsil in Bharatpur district. There is damage in almost every house in Junethar, one of the worst affected villages in the region. That evening, six men of the village were in the Maharaja Surajmal College grounds for their exercise routine. When the dust started swirling, the men thought it would pass and waited. But within minutes, the storm became fierce and blew three of the men into the air, landing them in far off places. The remaining three took cover under a gateway to the college near a large pillar. But the pillar collapsed in a matter of seconds and all three men died instantly. The ones who had been blown away lived to tell the story. One of the men who died, 20-year-old Chandravir, was going to join the Delhi Police on May 15. Some people consider themselves lucky. Take for instance Arun Kumar of Patholi village of Agra district, who runs a hair cutting salon. His kids were inside the hall when the front portion of the roof started leaking. When Kumar went to check, a portion of the roof collapsed, but Kumar’s family managed to escape to safety. Many people lost their livelihoods too as cattle, sheep and goats were killed by the storms. In Kheda Karauli village of Kumehr block in Bharatpur district two brothers, Prahlad Singh and Malkhan Singh, lost most of their sheep. In Karahi village in Agra district, Govind Singh Pradhan lost a major portion of his dairy farm. He started the dairy with a loan of R70 lakh under the Kamdhenu scheme in January 2017. Pradhan estimates the loss at around R15 lakh. He says he will now find it difficult to repay the loan. One of the reasons for the scale of the damage is the poor quality of construction. Houses of poor people were not constructed with high quality materials. At other places, like the massive pillar in Junethar, the structures were not built properly. They lacked proper foundation or binding material like cement which would have provided resistance against the winds and rain. Bharatpur’s famous honey industry has also been affected. Sunil Kumar Gupta, who runs a honey factory on the Bharatpur-Agra highway, incurred damages of up to R50 lakh. One of the walls of his factory collapsed and fell on the honey drums. The honey flowed out and the rain washed it all into the drain, making recovery impossible. “Had we been alerted, we would have taken precautionary measures,” says Gupta. “The intensity of the dust storms was unprece-dented,” says J P Singh, chief programme manager of Lupin Foundation, a non-profit in Bharatpur which is working with communities on restoration. 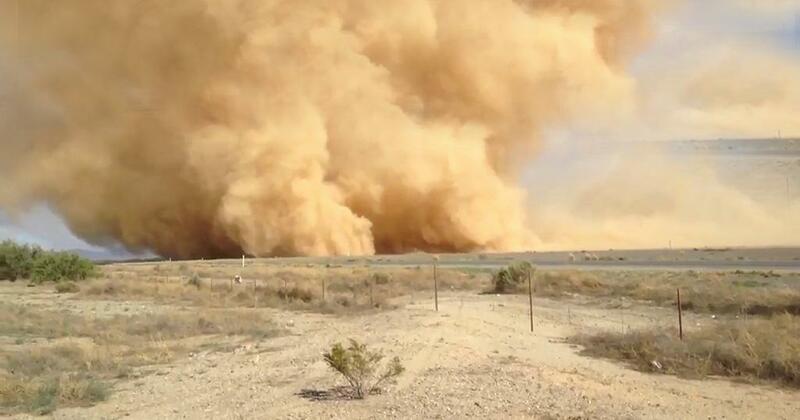 “Dust storms are common in this region, but are accompanied by very little rain. But this time it was different—heavy rains, hails and strong winds,” says Puneet Verma, programme coordinator at Lupin Foundation. In the aftermath of the storms, people are facing two major problems—lack of water and electricity. For instance, in Bharatpur, the storms uprooted some 5,000 electric poles. People are not able to use their water pumps in the absence of electricity. Taking advantage of the situation, water and electric generator suppliers are hiking prices—a bottle of water now costs R50 in Bharatpur, when the actual price is about R5. The cost of hiring an electric generator doubled. Government agencies are providing relief and compensation, but the pace is slow. Hemant Gera, secretary of Rajasthan’s Disaster Management Authority, says that “two types of relief operations are underway—ex gratia relief to the victims of the dust storm and infrastructure restoration”. Verma says the weather patterns have changed this year. “Earlier, there used to be 10-15 days of intense heat during spring and early summer, ending in a dust storm with little rainfall. But now that cycle has reduced to 4-5 days and the amount of rainfall has increased, and so have the dust storms,” he adds. Similar tales of changing weather patterns abound from all the other regions and states that witnessed storms this year. But are meteorological and disaster agencies of the government prepared to grapple with the changing nature of weather? As the Arctic has continued to warm and the temperature difference relative to the equator has reduced, many strange climate anamolies have been witnessed around the world. Winters have become longer and more frigid in North America and Europe, droughts have increased in several parts of Europe, Africa and Asia and precipitation has become extreme and increasingly uncertain. India is no exception to this phenomenon. One of the most vulnerable countries to climate change, global warming has wrought frequent floods, droughts and heat waves in the country over the past two decades. In the past three months, the subcontinent has been in the grip of another extreme manifestation of climatic changes: convective storms (see ‘How it happened’,). Since March, several pockets of northern, central and eastern India have experienced squally weather over nine separate large-scale spells. Pre-monsoon storms have hit several parts of the country. But while the timing of the stormy weather did not come as a surprise, it was the extent and intensity that caught India’s weather personnel and the general populace unaware. “Climatologically, these storms were anything but typical. Initial analyses have revealed several reasons for the stormy weather, including the activity of the Western Disturbances (WDs), the low pressure over the Indo-Gangetic plains and the intense heating in west and northwest India,” says M Mohapatra, director-general of Meteorology at the National Weather Forecasting Centre, India Meteorological Department (IMD), New Delhi. Heat is undoubtedly a factor in the formation of storms. The correlation of the timing of the storms with periods of intense heat is clearly evident in the weather outlook published by IMD each week. Take for example the most severe and damaging of the episodes that occurred in the beginning of May. In Rajasthan, one of the worst-affected states, temperatures of over 46°C were recorded towards the end of April. In next door Pakistan, temperatures touched a record-breaking 50°C. States such as Haryana and Himachal Pradesh have registered temperature increases of 4.8°C and 4.5°C respectively. Maximum temperatures across the Indo-Gangetic planes, right up to central India, were up to 8°C above normal, ushering in heat wave conditions across north, northwest and central India in the build up to these dangerous storms. The culprit is the WDs—climatic flows that originate in the Mediterranean and make their way across west and central Asia before entering the Indian subcontinent via the Western Himalayan region. WDs manifest as low-pressure areas embedded in the westerly winds-planetary winds that flow from west to east between 30°-60° latitude. They originate in the Mediterranean region and travel over Iran, Iraq, Afghanistan and Pakistan to enter India loaded with moisture, where the Himalayas obstruct them, causing rain and snow in the western Himalayas. “The difference in temperature—between the Eurasian region and the sub-continent—manifests in narrow bands of high velocity winds in the upper atmosphere which are called jetstreams and are carried by the WDs. Usually, the gradient is larger during winters and reduces in summers which, in turn, influences its impact on the weather in the Western Himalayan region and over the Indian landmass,” says Mohapatra. For long there has been consensus over the seasonality of active WDs in the Indian region. A study published in the Quarterly Journal of the Royal Meteorology Society in 2017 mapped the seasonality of WDs based on multi-decadal observations starting from the mid-20th century. The findings confirmed that WDs typically peak during December to February and gradually subside after March, when the pattern shifts pole-wards. But in the past few years, changes have been noticed, both in the seasonality and impact of WDs. The cloud burst in Leh in 2010, the floods and landslides in Uttarakhand in 2013 and the excessive rain in Jammu and Kashmir in 2014 were all linked to these disturbances. As the Arctic warms, the difference in temperature between the Arctic and the equator has reduced, particularly during recent winters which have seen highly anomalous heating around the North Pole. A warmer Arctic has been correlated to the extended winters punctuated with blasts of frigid weather in the northern hemisphere. A 2015 study published in the Environmental Research Letters shows the weakening temperature gradient is, in fact, causing the jet streams to meander rather than take a straight course which, in turn, affects the seasonality and movement of the WDs. Additionally, steep increases in temperatures in the Western Himalayan region and the Tibetan Plateau have been linked to a further destabilisation of climatic patterns in the region, according to a paper published by the Indian Institute of Tropical Meteorology, Pune. Western Himalayas and the Tibetan Plateau are considered to play a crucial role in maintaining the hydrological and weather cycles over the Indian subcontinent. Rapid warming, which has caused temperatures to increase by up to 3.5°C since 1951, have been linked with increased variability in the distribution and direction of WDs and associated precipitation. “Correlations between WD activity in India and the warming around the Arctic are emerging and it is possible that these weather anomalies will rise in the future as a result of further weakening of the jet streams,” says Akshay Deoras, an independent weather forecaster. One doesn’t have to go back too much in time to observe the change in WD activity over the subcontinent. Just last year, active WDs in May and June stalled the progress of the monsoon winds beyond the south-western tip of the country for over two weeks. In fact, since 2010, there have been at least five years when the WDs have deviated from their normal distribution. This year the change in distribution is particularly stark. Instead of the normal 2-3 active WDs seen during the months of April and May, over the past month and a half, 10 separate active WDs have been observed—seven of which occurred in April and the remainder in the first two weeks of May. “More than the frequency, what has increased the intensity of storms is the location and intensity of the WDs. The jetstreams carried by WDs are not uniform in velocity across the band. The jetstream core, atypically for the current season, seems to have undergone divergence in the upper levels which, in turn, causes a convergence of air lower down in the atmosphere. This is one of the contributing factors towards the intensity of the storms,” explains Mohapatra. The timeliness of active WDs is not the only change that has fueled extreme weather events in the recent past. While changes in the latitudinal positions of the WDs are worrying experts, discripancies in the vertical profile of winds are also affecting the jetstreams. According to B Abish, who has been studying the changes in the WDs and the subtropical jetstreams at the Nansen Environmental Research Centre India, Kochi, while the general WD circulation is weakening, the trends over the Indian region are peculiar. “The WDs are not only active over the Indian region for a longer period of time, but the jetstreams over the region have also strengthened. The high levels of emissions in the Indo-Gangetic basin increase the temperature of the atmosphere by absorbing solar radiation. This increase in atmospheric temperatures changes the vertical temperature gradient in the atmosphere and triggers a strong downward wind movement from the upper levels of the atmosphere, up to 12 km high. These downward drafts join the jetstreams as they enter the subcontinent and strengthens them. This seems to have had an impact in the recent spate of storms,” says Abish. Dust storms due to heat-powered winds are normal in several parts across the Indo-Gangetic plains, particularly in Rajasthan which typically has very low moisture content in the air. The third ingredient in this dangerous concoction, which made the storms ever more damaging, is the component of moisture. In addition to the moisture-laden winds of the WDs, easterly winds blowing from the Bay of Bengal, made the situation more volatile. The cyclonic circulations across the Indo-Gangetic plains arranged themselves along a line of low-pressure or a trough that ran east to west, right from West Bengal and Odisha all the way up to Punjab and Rajasthan. As a result, moisture-heavy easterly winds interacted with the cyclonic circulations powered by the WD and caused widespread thunderstorms, squalls and dust storms across the subcontinent in perhaps the most widespread occurrence ever observed in a single season. “Easterly winds from the Bay of Bengal have been known to interact with WDs, but this usually occurs during winter months. This year, these easterlies have continued well into May and have interacted with the WDs owing to the east-west trough formed across the country, further fueling intense activity over large parts,” says Mohapatra. While it is common in the winter and pre-monsoon season for easterly winds to bring rains to the east coast of the country, anomalies in sea surface temperatures over Bay of Bengal seem to have spurred greater moisture transport than usual. The last week of April, just before the series of storms struck India, saw sea surface temperatures over the Bay of Bengal between 1 and 2 degrees above normal. At the same time, sea surface temperature anomalies in the northern Arabian Sea were also around similar levels. Hotter than usual conditions over the Indian Ocean further increased the moisture carried by both westerly and easterly winds that culminated in the spate of storms. There are clear indications of how the general trend of warming is exacerbating stormy weather during the pre-monsoon season. The general physics behind storms unequivocally points at a higher incidence and intensity. A review of the EM-DAT Disaster Database that compiles information regarding disasters the world over reveals a worrying trend. One has to go back 40 years to see the last time convective storms during this season caused comparative loss of life. In 1978, storms in March and April across North and East India caused the deaths of over 600 people. But large-scale convective storms in the pre-monsoon season were few and far between. Between 1980 and 2003, just nine deadly convective storms were recorded in India in the March-May period. However, a steep increase has been observed in the last 15 years. Between 2003 and 2017, 22 such storms were observed over the Indian region accounting for nearly 700 fatalities compared to 640 fatalities in the preceding 22-year period. In 2018 alone, 423 people have died owing to extreme weather systems. Indeed, even by comparison to recent years, 2018 has been exceptional in the sheer scale and devastation caused. Not everyone is convinced though that the situation this year is clear sign that such events are a sign of anomalous atmospheric activity. “I do not think that the current weather patterns are anomalies. The frequencies of WD and the meanderings of the jetstreams is a natural variability of the atmosphere. The WDs can modulate the frequencies of the dust storms. Similarly, the position of the jetstreams can also influence the frequency of the dust storms. The jetstreams are characterised by wind shear both horizontally and vertically which has significant impact on the development of the storms. Some researchers have linked the frequencies of dust storms in East Asia to the Pacific North American pattern. That way everything can be correlated or tele-connected,” says Someshwar Das, a professor of atmospheric sciences at the Central University of Rajasthan. 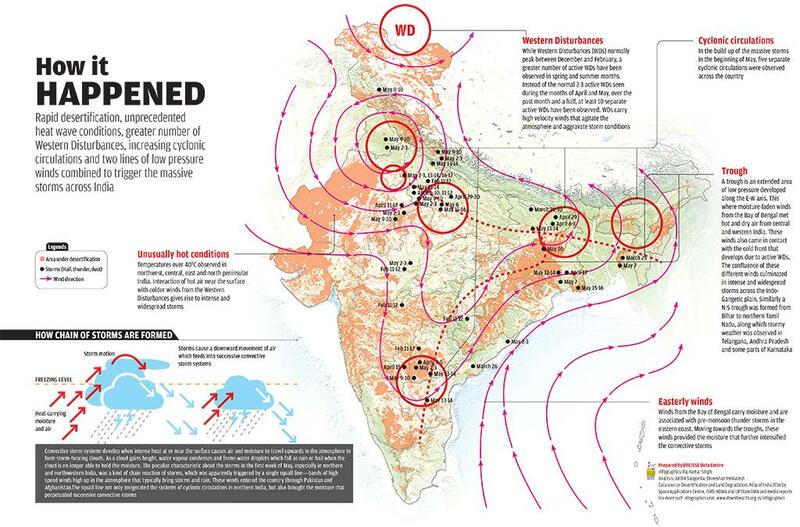 Still, it seems difficult to chalk up 2018 as simply a one-off; there is a clear trend of increasingly dangerous pre-monsoon storms which could have a bearing on more than just India’s climate. For one, the large-scale cooling of the subcontinent due to increased number of storms lasting later into the season could affect the progress of the monsoon as it reduces the strength of onrushing monsoonal winds which enter the subcontinent in the beginning of June. Another slow-onset concern is the transportation of dust in such large scale convective activity. A mapping of the hostpots of extreme weather in the current season shows an incidence of storms primarily in zones where desertification of land has been observed, apart from the Indo-Gangetic plains which is the primary source of dust in South Asia. Recent figures suggest that 26 of the 29 states across the country have reported an increase in desertified area in the last 10 years. Nearly 30 per cent of the country is already desertified and the trend of land degradation seems to be getting worse. Interestingly, while desertification has increased, there is still a lack of clarity on how this is linked to dust loading in the atmosphere. A recent study, published in Scientific Research in 2017, looked at aerosol measurements 2000 to 2015 found that dust loading in the atmosphere had actually decreased by 10 to 20 per cent during the pre-monsoon season as compared to levels at start of this century. Researchers linked this decrease to an increase in the pre-monsoon rains which reduces dust emissions. But more than slow onset consequences like desertification, the immediate concern is the impact of dust on thunderstorm activity itself. Physically, dust is categorised as an aerosol, which can provide sites for the aggregation of water droplets in rain-bearing clouds and intensify rainfall. “It is possible that aerosols like dust can have an invigorating effect on cloud systems and could aid the formation of these clouds since more droplets can be formed. The higher and taller clouds, in turn, trap more heat radiating from the surface. So, in a way, aerosol loading can cause a self-perpetuating cycle leading to stronger convective cloud systems,” explains Sagnik Dey, associate professor at the Centre for Atmospheric Studies, Indian Institute of Technology, Delhi. Other than intensifying rains, dust particles also increase the volatility in the vertical movement within clouds which gives rise to an increasing occurrence of lightning strikes. Again lightning is not a new phenomenon in the country. In fact, lightning strikes are the leading cause of death among natural disasters as listed by the National Crime Records Bureau, causing close to 10 per cent of all deaths ascribed to natural disasters. However, most of these deaths occur during the monsoon when convective storms peak. The 2018 pre-monsoon season gave a primer on how the scourge of lightning could be extended beyond the monsoon. Towards the end of April, in a spell of just 13 hours, Andhra Pradesh was struck by over 36,000 lightning strikes. Across the country, more than 40 people have died in about a month. A paper published in Atmospheric Research in 2016 revealed the correlation of lightning activity in the Indian subcontinent with environmental factors including aerosol and dust. Researchers found a positive correlation between the occurrence of lightning and the location of the two main sources of aerosols in the Indo-Gangetic basin—the Thar Desert that provides significant amounts of dust to western, northwestern and central India and the Gangetic plains in the east, which is a significant source of finer mineral dust and industrial aerosols. Further, the study even suggests that based on projections of humidity, heat and aerosol loading, occurrence of lightning is likely to increase in the future. 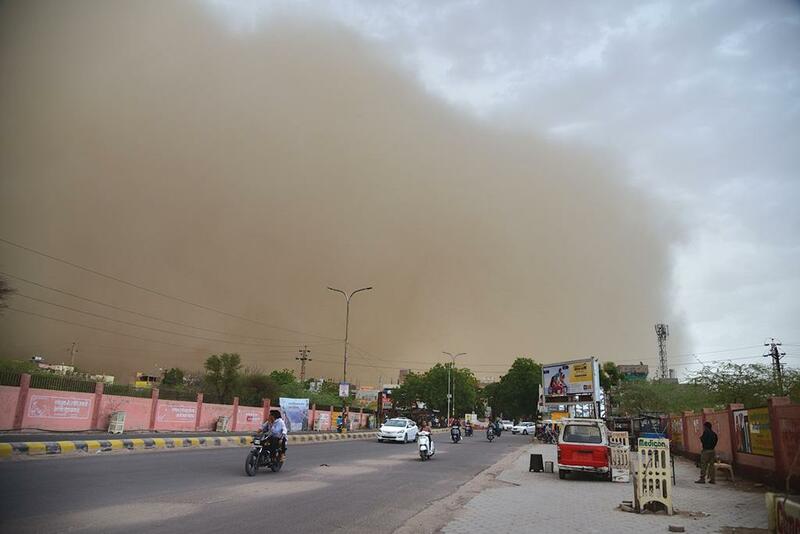 The increasing number of dust storms and thunderstorms in the pre-monsoon period must constitute a reason for concern for the met department. While stormy weather during this time of the year is not unknown, forecasting ability, especially during this season, seems to be out of sync with the speed at which climatic and weather systems over the Indian subcontinent are evolving in a warming world. On April 26, IMD forecasted thunder-storm/dust storm over Punjab, Haryana, Delhi, Uttar Pradesh and Rajasthan. It said the storms would occur at isolated places. But there was no indication of how intense the storms would be. On April 30, another advisory said severe thunderstorms and gusty winds would strike over eastern and northeastern India. There was no prediction of any such activity in the northern part of the country. But the storms on May 2 were the most intense and caused the greatest damage in the northern states of Uttar Pradesh and Rajasthan. Local people are more than aware of this failure in IMD’s predictions. 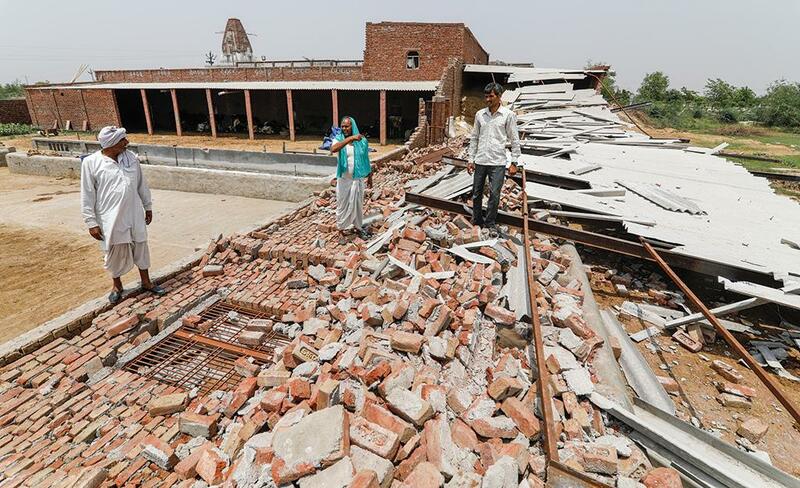 “On May 2 nothing had been predicted by the weather department, but such a big storm struck,” says Govind Singh Pradhan from Karahi village, Agra district. Then, of course, there are times when IMD predicted an event but completely missed the mark on the specifics. For instance, in the first week of March, IMD predicted thunderstorms accompanied by hail in large regions of north and eastern India. But its own report, a week later, states that while there was no hail anywhere, there was rain accompanied by thunderstorms in 75 per cent of the predicted region. The accompanying winds that are characteristic of a storm were also not present. M Mohapatra, director-general of Meteorology at the National Weather Forecasting Centre, IMD, says this assessment is not correct. According to him, the real forecasting and information dissemination happens away from the view of the larger public. According to him, NowCast models, with a constant eye on evolving weather from space, pick up signs of the storms around three hours in advance. However, a window of just three hours is a critical constraint. Far from being adequate to secure houses or fields, it is barely enough to ensure personal safety especially in storms as intense as those witnessed in early May. India’s attempts at parameterising dust and incorporating it in weather models are relatively new. The National Centre for Medium Range Weather Forecasting (NCMRWF) integrated the component of dust just five years ago. In the last two decades, through significant improvements in satellite and 3-D imaging, specific forecasts are provided days in advance worldwide. So why is it that IMD still provides broad, hit-and-miss kind of forecasts? The reason, says Guffran Beig of IITM, is the difference in the nature of the storms over the Indian region. “The storms in the beginning of May escaped detection because it was a different weather phenomenon, unlike climatic-scale storms seen in the Middle-East. In the recent storms, there was a low vertical torque while the horizontal torque was dominant. So the unsettled dust, that could have indicated the storms remained near the surface, did not register in the boundary layer conditions. This is why these storms could not be foreseen,” explains Beig. Beig’s dust module, based on observations conducted to evaluate and model air quality implications of dust in major cities in the SAFAR project, has also been used for limited weather forecasting applications. However, most of India’s forecasting ability for pre-monsoon thunderstorms, including in the NowCast model, comes from multi-year field experiments named Severe Thunderstorm Observations and Regional Modeling (STORM) experiments which have been conducted since 2006. The experiments have been conducted with a view to understand storm formation and evolution and to ultimately be able to incorporate findings into forecast models. The experiments were conducted in three phases for storms in east, northwest and peninsular India respectively. For NCMRWF, observations collected since the experiments began have gone towards strengthening the Unified Model (UM). But despite having about 11 years of observations, there are still gaps in the data. “We have still not been able to procure all the instruments that we require to fill in all the blanks,” says former NCMRWF scientist Someshwar Das, who has been closely associated with the STORM experiments. Further, it is also the scale of the storms that has kept forecasters in the dark. While observations such as wind patterns or temperatures are relatively large-scale and follow consistent trends, highly variable local factors are what determine the fate of a storm. “These storms were extremely concentrated and small-scale, dependant on highly variable local conditions, and so are difficult to capture in models,” says Mohapatra. This is the major issue when it comes to forecasting these storms, according to Das. “These mesoscale convective storms happen at very small-scales and you need very fine resolution of about 1-2 km scales to detect thunderstorms.” Compared to this, the UM used by NCMRWF uses a model resolution of about 10 km, while the SAFAR dust module only functions at grid sizes of about 100 km. One instrument which might have been useful, especially in detecting dust levels close to the surface and horizontal wind velocities, is the Doppler radar. 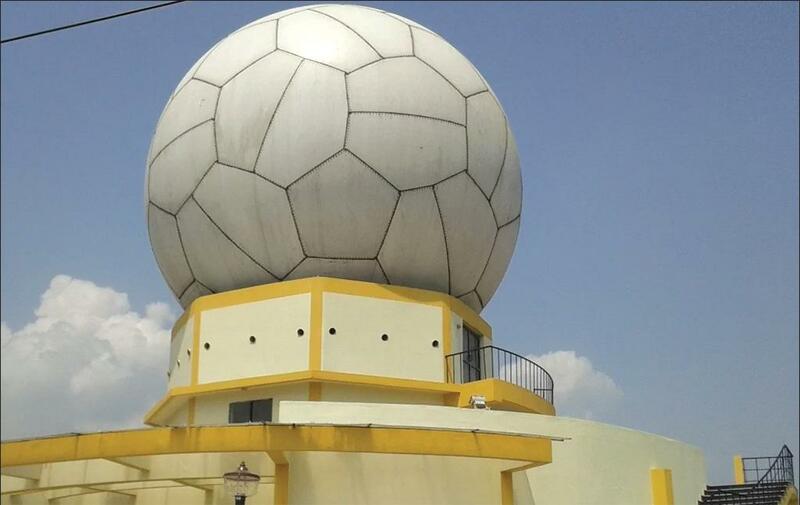 Despite the criticality of ground-based instruments for India, where tropical weather phenomena develop and dissipate in a matter of hours, IMD has so far only been able to install 25 Doppler radars across the country. Cumulatively, the range of these would be around 0.45 million sq km, which is just over an eighth of India’s total land area of nearly 3.3 million sq km. “IMD has plans to increase the number of radars to about 50 covering the whole country,” says Das. Incidentally, the recent devastating storms also brought into question the maintenance and upkeep of instruments. The nearest Doppler radar to the May 2 epicentre was situated not too far away in Jaipur. However, the radar was not functioning. While India still grapples with forecasting, other countries which have been facing increasingly severe dust and sand storms have been attempting to control the effects of the storm and limiting the destruction. One notable example is the Great Green Wall that has been developed by China along the Mangolian drylands. The massive corridor of vegetation purportedly acts as a wind break for intense sand storms emanating from the north and reduces the transport of dust further south, thereby limiting the possibilities of desertification. While India might have to start thinking on similar lines to get its desertification problem under control at some point, the urgent task at hand is, undoubtedly, to improve its weather forecasting and monitoring infrastructure. (This article was first published in the June 1-15 issue of Down To Earth under the headline '100 days, 44 storms, 16 states, 423 deaths, not a blip').